For many people looking to improve their appearance, the chin is often a hotspot of criticism. No one feels flattered when they see that the skin below the chin, where it meets the neck, hangs low or looks too plump. This area is called the submental triangle or area, and there is thankfully a new and powerful treatment option to restore youthfulness. KYBELLA™ is the first of its kind – an injectable drug that helps contour and reshape the appearance of submental area. Food and Drug Administration (FDA) approved, KYBELLA™ does not require any surgery, and is considered one of the safest and most-effective ways to directly address this problem area. Call us at (818) 284-4003 for more information from the Advanced Dermatology Center . 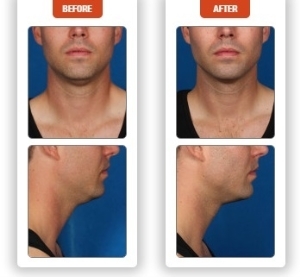 Even though a sagging submental region – or a “double chin” as it is commonly called – detracts from your appearance by making you look bulkier or older than you actually are, it is not typically directly targeted for treatment. Perhaps people chose to ignore in the past because there was no simple and direct way to take care of it. KYBELLA™ has changed all that, and now appropriate action is easier than ever. What is KYBELLA™? The main compound in KYBELLA™ is deoxycholic acid, a formula that is not derived from human or animal sources. Rather, it is synthesized form of a molecule that is already naturally-occurring in your body. 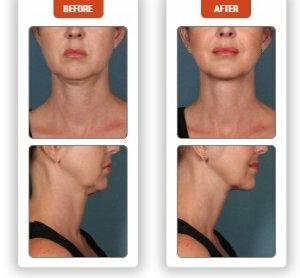 How effective is KYBELLA™? In our body, deoxycholic acid’s primary function is to destroy or otherwise absorb dietary fat. 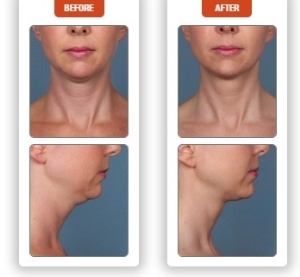 When KYBELLA™ is injected into the fat under your chin, it destroys any fat cells it encounters. Once your treatment cycles are complete, you should not require retreatment. KYBELLA™ is that effective! Are KYBELLA™ injections outpatient procedures? Injectable cosmetic drugs are well-known for their quick and effective methods, and KYBELLA™ is the same in this regard. Typical treatment sessions last about half an hour. More time may be necessary in some cases, however. What are the most common side effects of KYBELLA™? Since KYBELLA™ is created in a process closely regulated by the FDA, it has earned praise for its safety. As far as negative reactions go, the most commonly reported were swelling, bruising, pain, and numbness in the targeted area. Number of Treatments Required - Most patients need 2-4 treatment to see optimum results. These treatments are scheduled 6 weeks apart. More treatments may be required, depending on the extent of the fat and the individual response to the treatment. Treatment Time - KYBELLA™ takes just 20-30 minutes to perform. You will be in and out of our office quickly. Recovery Time - After receiving KYBELLA™, the injected area will swell for up to 4 days and may feel a little numb. This is completely normal and to be expected. 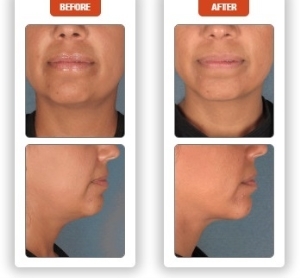 Results - Reduction of fat under the chin resulting in a thinner, more sculpted chin and neck. Here at our medical and cosmetic office in Burbank, we are proud to be able to bring a wide variety of treatment options for those seeking to improve their appearance. We understand that you might have questions, concerns, or other inquiries related to KYBELLA™, so we encourage you request your free consultation with our cosmetic nurse team today. With our knowledge and guidance, you can dispel your doubts and start down the path to a more confident you. Contact us today.